Celebrate the season with a sweetly spiced Pumpkin Cheesecake is nestled in a gingersnap crust and topped with light and cinnamon-y whipped cream. This easy to make pumpkin cheesecake recipe is easy to make ahead and perfect for the holidays. It’s happening, I’m watching Elf. I waited as long as I could but things are not super smiley right now in my life and I needed some holiday cheer. I’m not sure why, but Elf makes me happy even when I’m feeling the complete opposite. Within a few minutes, I’m ready to put up the Christmas decorations and start wrapping the gifts. 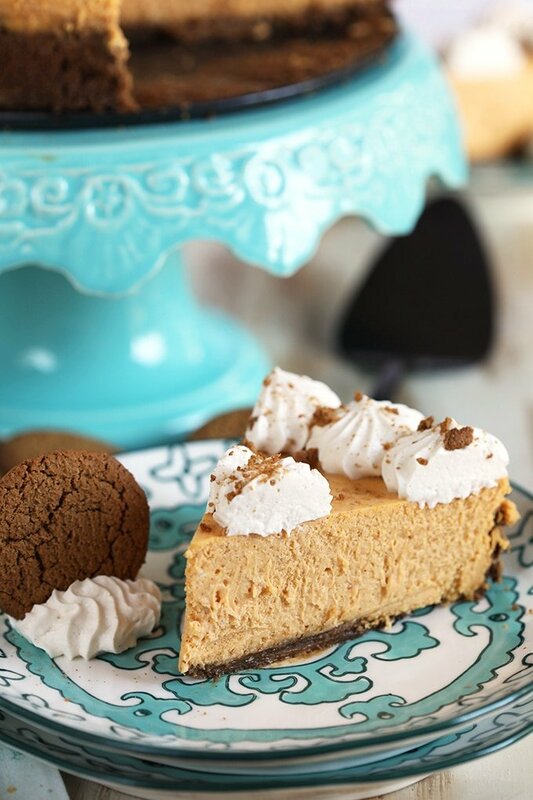 And baking….baking all the sweet things I can dream up…..like the very BEST Pumpkin Cheesecake recipe. This is, by far, one of my favorite desserts for the season. I made this Mini Pumpkin Cheesecake recipe a few years back that’s topped with a Pecan Praline with a kick of bourbon. 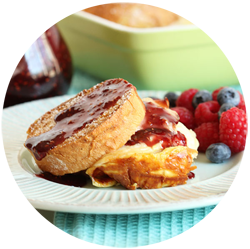 It’s a southern style cheesecake that I can’t get enough of….good thing they’re mini for easy portion control. But before I even made the mini cheesecakes, I always made this easy Pumpkin Cheesecake recipe to take for holiday gatherings. Cheesecake is surprisingly simple to make but always looks so impressive….especially, when your cheesecake recipe yields perfect results every time. 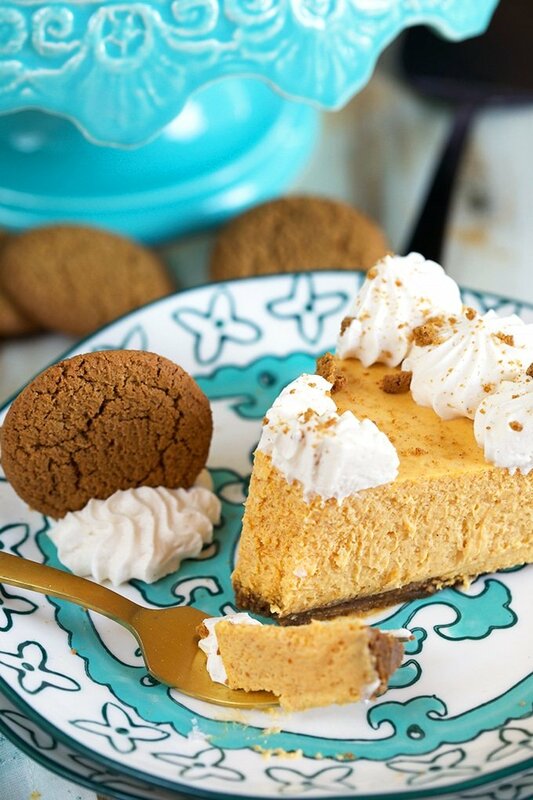 This Pumpkin Cheesecake recipe is light and creamy, slightly spiced and baked in a gingersnap crust. It’s seriously the BEST Pumpkin Cheesecake recipe EVER made and ensures perfect results every time. 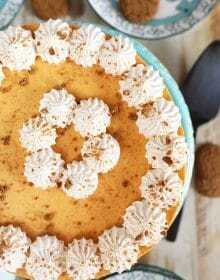 How to you make easy Pumpkin Cheesecake? 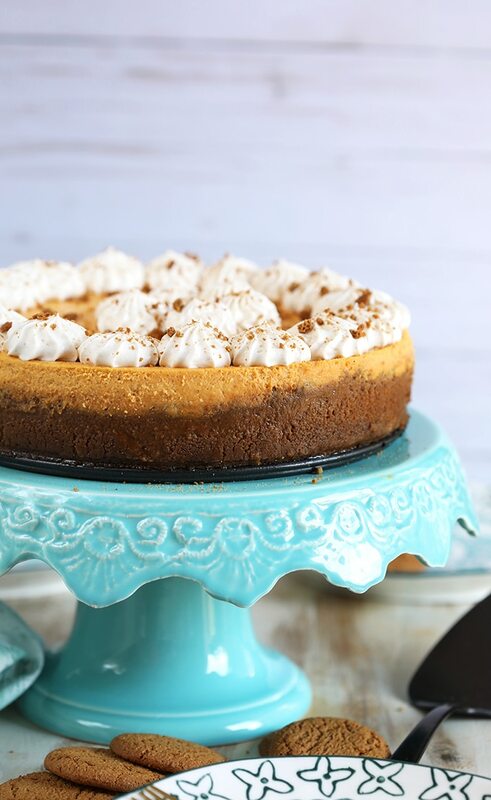 My Pumpkin Cheesecake with Gingersnap Crust is always a crowd pleaser and the fact that you can make it in advance saves so much time during the holidays. It’s freezer friendly, too! Beat in the sugar, pumpkin, vanilla and pumpkin pie spice scraping down the sides of the bowl, as needed. Beat the cream, powdered sugar, cinnamon and vanilla until stiff peaks form. Using a piping bag, pipe the whipped cream onto the top of the cake. Sprinkle with crushed gingersnap cookies, if desired. Can Pumpkin Cheesecake be frozen? Place your already cooled cheesecake on a baking sheet and freeze, uncovered, until firm. Wrap your frozen cheesecake tightly in plastic wrap and then wrap, again, in heavy duty aluminum foil. Place the wrapped cheesecake in a large freezer bag, press out the air and seal. Freeze your cheesecake for up to 6 months. To thaw, unwrap your cheesecake and allow to thaw at room temperature for 1 hour. Refrigerate any leftovers. How do I keep my cheesecake from cracking? Cheesecakes can crack for many reasons, one being the cheesecake is too dry. This Pumpkin Cheesecake recipe is moist enough that your cheesecake should not crack at all. However, there are other factors which can cause your cheesecake to crack. 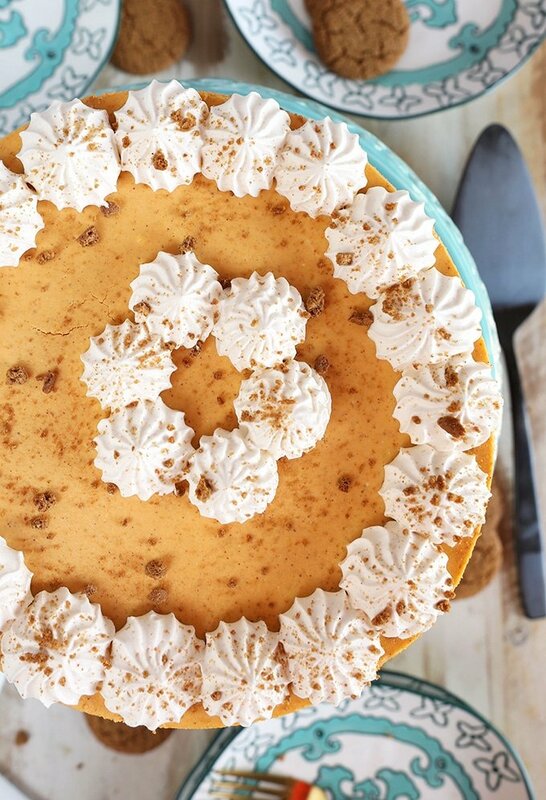 Here are a few tips to ensure you end up with a picture perfect Pumpkin Cheesecake. Be sure all ingredients are room temperature. This will help the filling come together easily and smoothly without having to over mix the filling which can contribute to cracking. 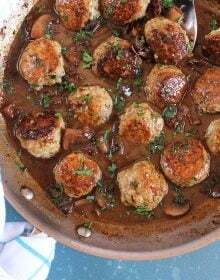 Grease your pan. Cheesecakes love to cling to the sides of the pan and then shrink when cooling causing crater like crevices to form in the center of your cake. By spraying lightly with cooking spray or greasing with butter, your cheesecake will be able to pull away from the sides easily without cracking. Add the eggs to the filling last and add them one at a time. Eggs are the binding agent and are the main culprit when it comes to trapping air bubbles. Air bubbles can cause cracking. So, by adding the eggs last you help reduce the amount of air bubbles in the filling. Bake your Pumpkin Cheesecake in a Bain Marie….or water bath. To create a water bath, cover the sides and bottom of your cheesecake pan with aluminum foil to provide a barrier from the water. 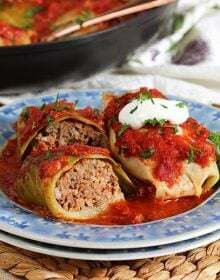 Use heavy-duty aluminum foil, if possible, and wrap outside of the pan as securely as possible. Place the cheesecake pan inside a high sided baking pan and fill the pan with 1 to 2 inches water or until the water is approximately half way up the sides of the pan. Bake your cheesecake at a lower temperature, I’ve found 325 degrees to be the ideal temperate. Resist the urge to over bake your Pumpkin Cheesecake. It will set up completely with the overnight rest in the refrigerator. No worries! How do you know when Cheesecake is set? You’ll know your Pumpkin Cheesecake with Gingersnap Crust is done baking by giving the pan a little shake (carefully so you don’t splash the water in your Bain Marie around!). If the cheesecake looks nearly set and just a small area in the center is still wobbly, your cheesecake is done baking. The center will set up completely while it rests. See how easy that is? And it’s like a pumpkin spice dream come true! I’ll be eating this easy Pumpkin Cheesecake for the next week, which is cool because I’ll need the energy to get me through putting up ALLLL the Christmas decorations. I swear they breed in the basement over the summer months. This Carrot Cake Cheesecake is one of the best things ever made. You can’t go wrong with this New York Style Cheesecake recipe. So simple! Salted Caramel Mocha Cheesecake is like a dream come true. I LOVE these Mini Strawberry Pretzel Salad Cheesecakes…you can make one big one, too! This savory spin is great for a cheese course….Basil Parmesan Cheesecakes with Tomato Jam! 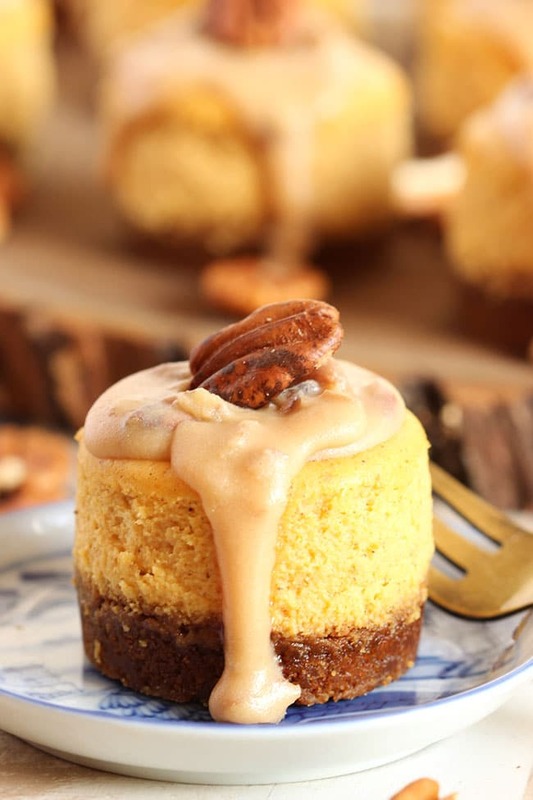 Mini Bourbon Praline Pumpkin Cheesecakes….need I say more. 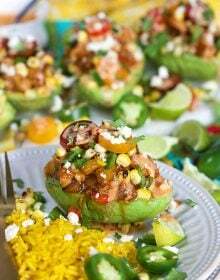 Want even more tasty desserts or easy family dinners? Be sure to follow us over on Instagram! 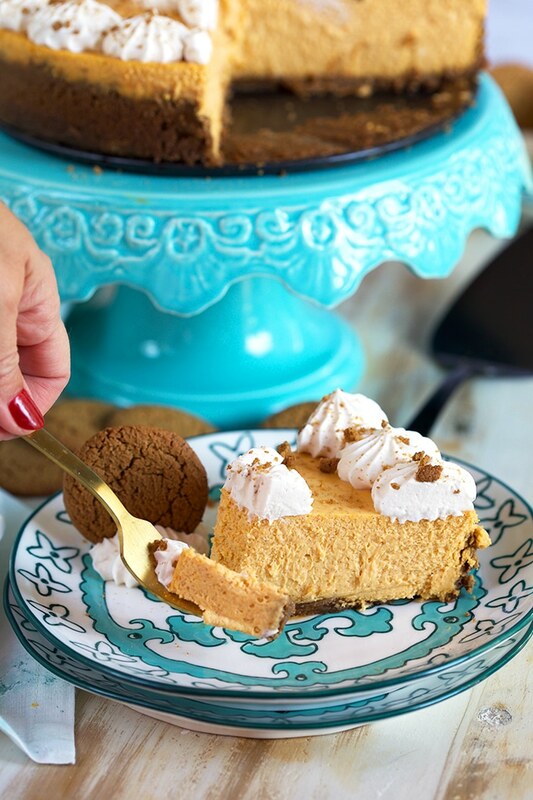 Super easy and freezer friendly, this Pumpkin Cheesecake with Gingersnap Crust is a must have for all your fall and winter holiday parties. Beat in the sugar, vanilla, pumpkin puree and pumpkin pie spice scraping down the sides of the bowl, as needed. Add the cream, sugar, vanilla and cinnamon to a bowl. 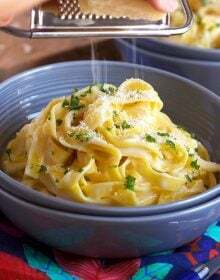 Beat the ingredients with a hand mixer fitted with the whisk attachment until stiff peaks form. Using a piping bag, decorate the top of the cake with the whipped cream or spread the cream over the top of the cake with a spoon. To freezer: Place the baked and cooled cheesecake on a baking sheet and freeze until firm. Wrap the frozen cheesecake tightly in plastic wrap and then wrap again in aluminum foil. Place the wrapped cheesecake in a large freezer bag and store in the freezer for up to 6 months. To thaw: Remove the cheesecake from the freezer and unwrap. Place the cheesecake on a platter and thaw at room temperature for 1 hour. 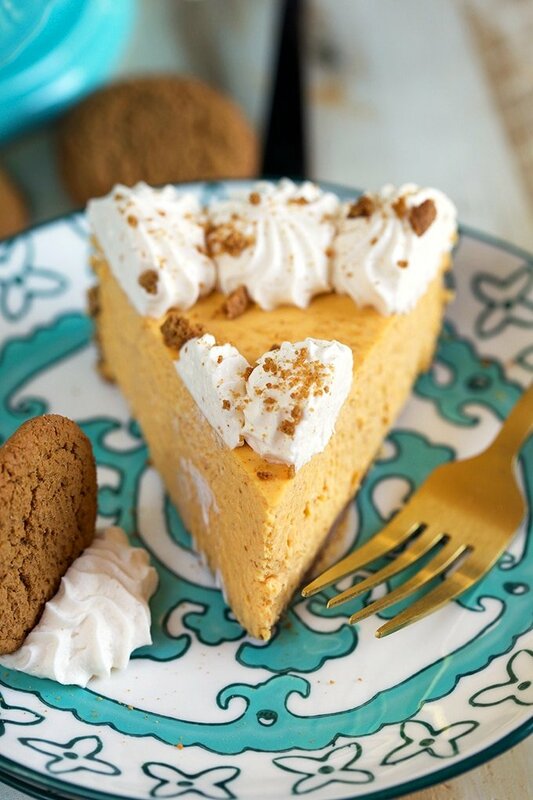 Total pumpkin cheesecake perfection, YUM! 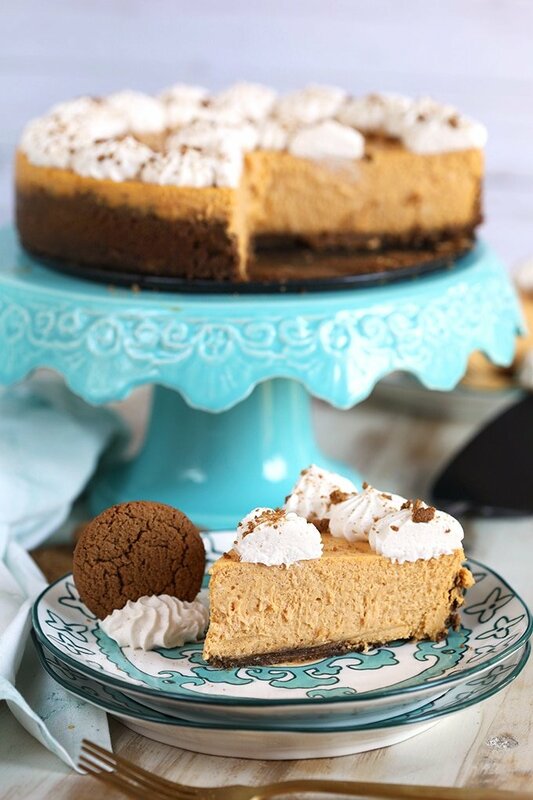 I love the whipped velvety texture on this pumpkin cheesecake. WOWZA! Looks so amazing and perfect for fall! I love cheesecake, as it’s my favorite dessert, so I am definitely adding this to my must try list! Thank you! 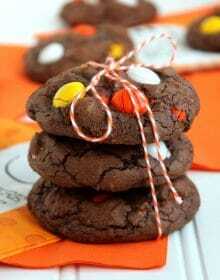 It’s unbelievably easy to make! 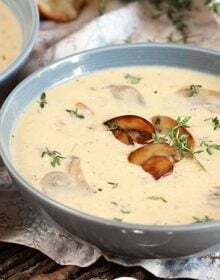 Totally making this for Thanksgiving! YUM! My family is crazy about cheesecake. 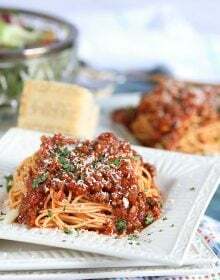 Can’t wait to make this for Thanksgiving! I have a question about the crust. The title of the cheesecake says a ‘gingerbread crust’ but there is nothing in the crust but Graham Crackers and butter. 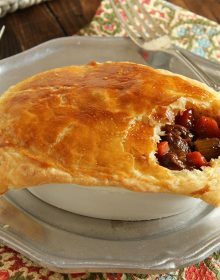 Is the crust recipe missing something? Hi Sue! 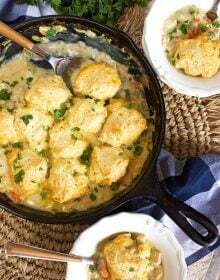 Thank you for checking out the recipe! It’s not a gingerbread crust, it’s actually a gingersnap crust made with crushed gingersnap cookies. You can use graham crackers, if you prefer.